There are great thermal baths and open air pools in Budapest, with a few things to bear in mind you can absolutely enjoy them. Do not take anything of great value (pda, laptop, jewelry, bigger sum of money, etc.) 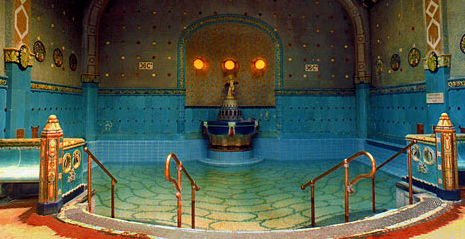 to the spa baths or lidos in Budapest. If you do, ask for a specialty safe box for a tiny surcharge for the peace of mind (see: Szechenyi Baths safety deposit box). You may think that a locker is safe, but it may turn out that one sticky-handed locker guard is enough to take away some of your valuables. And unfortunately, it has happened on some occasions. Some tourist stories feature thieves where the very person who should take care of your goods will check out the pockets for little treasures. Even though the chance my be slim, Budapest has several baths, and one thieving locker lady is enough to ruin the reputation of the rest of the baths. Sorry about that. Make sure to leave your jewelry, etc. in a hotel safe rather. On the other hand, taking a good bath means that even if you do not leave your stuff in a locker, you leave them on a towel, attracting pickpockets, thieves in the baths, or in the car (car theft is prevalent in Budapest). If you are with many friends, and somebody stands guard, having valuables with you may not be a problem, but leaving expensive goods unattended in Hungary is a call to action for a crime. So in short, never take anything valuable to the baths or swimming pools.